Nearly everyone in Nepal is still struggling, three months after the worst earthquake in over 80 years killed thousands of people and left hundreds of thousands homeless. 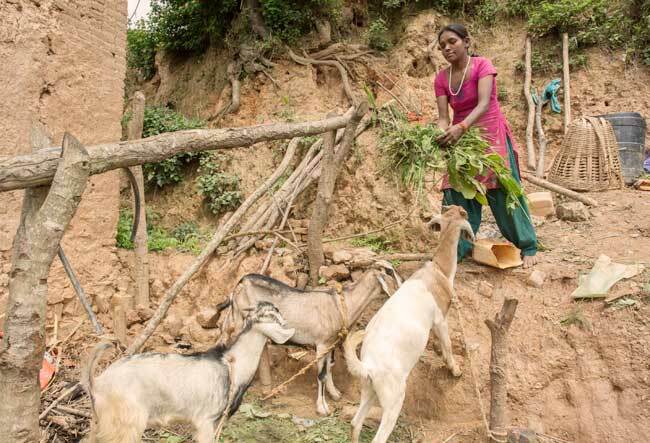 But life is even harder for the Dalits, the most marginalised group in Nepalese society. About 4.5 million of the Himalayan nation’s 26 million people belong to the group once known as “Untouchables”, at the bottom of the caste system. As a Dalit woman, Kamala is yet further disadvantaged. Men belonging to her caste at least have identity cards, but she has no rights to land or property, nor any access to education. 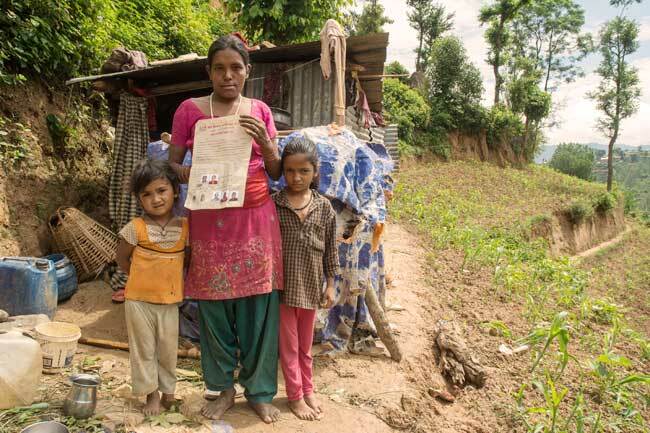 Since her husband died in the earthquake, she has been living in a corrugated iron hut on a dizzying mountainside with her two daughters, aged seven and 11, and eking out a living as a casual labourer on other people’s plots and farms. She works around six hours a day for 300 Nepali rupees (about £1.90); her 14-year-old son, who had to give up his education when he failed to sit one exam, and was not allowed to enter the next school year. He convinced his mother that he’d be better off working and bringing some money to the family. Sitting on a mat beside the ruin of her former home, Kamala describes what happened on April 25, the day of the 7.8 magnitude quake. (Further death and destruction was caused by a 7.3-scale aftershock on May 12.) She had gone up the mountainside with her daughters to buy a chicken to help the recovery of her husband, who had spent a month in hospital. By the time Kamala and the girls had scrambled back down the slope, neighbours had dragged her husband’s body out of the house. “I saw two feet sticking out from the blanket, and I recognised [his] sandals,” she said. Three days later, with the help of some neighbours and distant relatives, he was buried. Political change in Nepal means that the widow’s rights should be guaranteed – at least, that is the theory. Following a ceasefire with Maoist insurgents and the abolition of the monarchy, an interim constitution has been drawn up which outlaws discrimination and enshrines property rights. But endless wrangling means the constitution has still not been finalised, nine years after the process began. Help for Kamala came instead from Nepal’s tiny minority of 8,000 Catholics. Caritas Nepal has funnelled aid to victims from the Catholic aid network, including £3.3 million donated in England and Wales to CAFOD (Caritas in England and Wales). The widow received food – lentils, rice, salt, and cooking oil – a hygiene kit with soap, detergent, and disinfectant, and materials to repair the collapsed roof of her house. Caritas Nepal and its network of local volunteers will join in the work. Kamala has also been helped by a neighbour to obtain a “certificate of relationship” from the local authorities. The document is precious to her: it is the one piece of paper that gives her some form of identity, as it states that her three children belong to her. Normally only the husband’s name is on everything, making it practically impossible for rural women to gain any official recognition.